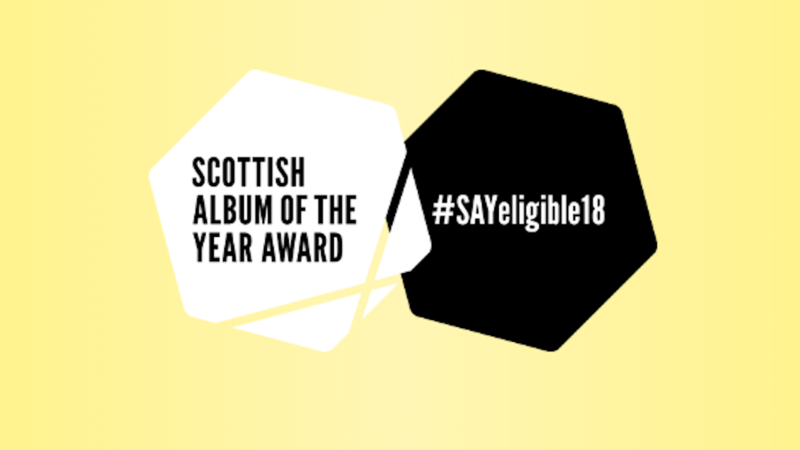 The Scottish Album of the Year (SAY) Award 2018 is now open for entries, with artists, labels and music fans now able to submit eligible albums to The SAY Award website to be considered for this year’s award. The SAY Award has no categories, and is open to all genres of music. Eligible albums must have been released between 1 April 2017 and 31 March 2018, with the submissions deadline being 23.59hrs on Thursday 31 May. Since its inauguration in 2012, The SAY Award has grown to become Scotland’s most popular and prestigious music prize. Developed by the Scottish Music Industry Association (SMIA) with support from Creative Scotland, The SAY Award offers one of the UK’s most lucrative prize funds and champions the extraordinary strength and diversity of Scotland’s musical landscape. Confirmed partners for 2018 include Renfrewshire Council, Paisley.is, Creative Scotland, TicketWeb, PPL and Help Musicians Scotland (Charity Partner). Once all eligible albums have been collated, 100 impartial ‘Nominators’, chosen from sectors including journalism, broadcast and radio, music retail and live music venues, will consider the titles from The SAY Award’s Eligible Albums list, nominating their five favourite albums and ranking them in order of preference. ‘Nominators’ include specialists in a variety of genres, such as jazz, classical, electronic and traditional folk, as well as key influencers from elsewhere in the arts. The SMIA assigns a score to each title in a Nominator’s Top 5, before announcing the 20 highest scoring albums as The SAY Award Longlist for 2018. The Longlist is then whittled down to a Shortlist of 10 albums, one of which will be chosen by music fans via an online public vote and the others decided by The SAY Award judging panel. Previous judges have included the composer Craig Armstrong, Turner Prize winning artist Susan Philipsz, Music Editor of The Skinny Tallah Brash, Edinburgh International Festival Director Fergus Linehan, Sub Club Partner/Director Barry Price and Scottish Ballet’s Sophie Laplane. The SAY Award Ceremony will take place on Thursday 6 September, returning to the stately setting of Paisley Town Hall for the third consecutive year. The winning artist will pick up a £20,000 cash prize, with the nine runners up each being awarded £1,000. Each Shortlisted artist will also receive an exclusively designed piece of artwork from the SAY Award Design Commission. Previous winners of The SAY Award are Bill Wells and Aidan Moffat’s ‘Everything’s Getting Older’ (2012), RM Hubbert’s ‘Thirteen Lost & Found’ (2013), Young Fathers’ ‘Tape Two’ (2014), Kathryn Joseph’s ‘Bones You Have Thrown Me And Blood I’ve Spilled’(2015), Anna Meredith’s ‘Varmints’ (2016), and last year’s winner, Sacred Paws’ ‘Strike A Match’, the critically acclaimed debut album which joyously blends African rhythms, post-punk guitars and indie-pop.